During a recent project we found a Java Debug Wire Protocol interface open at a server. 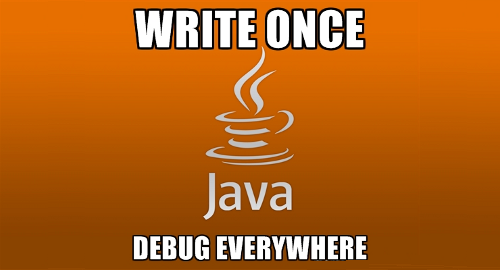 I was a bit surprised when I was able to attach to it using JDB, the Java debugger – this was too easy. Or was it? Well, that’s great, how about getting the output back or even an interactive shell maybe? That’s when things go painfully Java. If you open the documentation of JDB you don’t see too much features to work with: a handful of commands, no scripting support and as it turns out the expression syntax is also undocumented. new java.lang.String(new java.io.BufferedReader(new java.io.InputStreamReader(new java.lang.Runtime().exec("id").getInputStream())).readLine()) = "uid=1000(b) gid=1000(b) groups=1000(b)"
Still, I couldn’t figure a way to put this whole thing in a loop to read more lines. What about getting a reverse shell and getting rid of all the InputStream handling? Netcat was available on the target but without the -e option (aka GAPING_SECURITY_HOLE) enabled. There are of course a ton of other options to achieve the same result, but they all require either shell stream redirection or at least quoting. Since Runtime.exec() passess the commands directly to the OS, shell syntax doesn’t work immediately and also quotation marks are handled in a rather weird way by the JDB shell, so things like exec(“bash -c \”your > command\””) don’t work as expected. If you know other useful tricks for JDB, don’t hesitate to share it in the comments!